Scott Howson knew since February this day was coming. Rick Nash had asked for a trade out of Columbus, and the Blue Jackets general manager finally made it happen Monday by sending his team's now-former captain to the New York Rangers in a blockbuster deal that will have ramifications on both franchises -- and perhaps also on Howson -- for years to come. In return for Nash, the face of the franchise and the best player by a landslide to ever play for the Blue Jackets, Howson brought forwards Brandon Dubinsky and Artem Anisimov, defensive prospect Tim Erixon and a first-round draft pick back to Columbus. "It's about winning right now," Howson said on a conference call Monday night. "That's what you want to do. This is not a trade where we think we're going to be better five years from now. We think we can be better next year and we think these players can help us do that." Howson fielded offers on Nash at the trade deadline, but passed on them. He again spoke about dealing Nash at the NHL Draft last month, but never got what he wanted. The Rangers were always involved in the discussions with Howson, who said his talks with New York GM Glen Sather picked up considerably in the past week. Howson said he told Sather on Friday what it was going to take to get Nash, and the Rangers boss took the weekend to evaluate it before the two consummated the trade Monday. Howson said there was a slight bit of last-minute negotiating done, but the return package for Nash was set Friday and that's what he got. "I'm very pleased with the process; the market played itself out," Howson said. "We weren't going to do this deal until we got what we thought was fair value for a player of Rick's caliber. That came today. I'm glad we waited. It certainly gave us a chance to gauge what the market was." Even though dealing Nash means Howson has now traded the biggest hockey star Columbus has ever known, he said during a press conference at Nationwide Arena that it wasn't hard to pull the trigger on the deal because he and his staff had been diligently working toward making it happen for a long time. But in trading Nash, the Blue Jackets are signaling a complete changing of the guard. Nash has been with the franchise since it drafted him No. 1 in 2002, but he has played in only four Stanley Cup Playoff games -- without a single victory. He is nevertheless the franchise's all-time leader in every important offensive category. He's a seven-time 30-goal scorer who has twice scored at least 40. He has averaged 33 goals per season. Nash even committed to the Blue Jackets three years ago when he signed an eight-year, $62.4 million contract extension that included a no-trade clause. He played two seasons under that deal, but asked to be traded late last season when he was told the Blue Jackets were going through another rebuild. Nash said he figured by agreeing to be traded he would be helping the Blue Jackets in the rebuild. He also reportedly gave Howson a list of six teams he would be willing to go to: the Rangers, Penguins, Red Wings, Sharks, Flyers and Bruins. Since every team on Nash's list made the playoffs last season and is considered a strong Stanley Cup contender, it's also obvious that he was growing impatient. So now Nash, who had 547 points in 654 games as a Blue Jacket, is heading to New York in exchange for four pieces who all come to Columbus with potential and question marks. Erixon is a wild card for the Blue Jackets because of the upside he has as a 21-year-old defenseman who is a former first-round pick. The Calgary Flames made Erixon the No. 23 pick in the 2009 NHL Draft, but couldn't sign him and eventually traded him to the Rangers last summer. 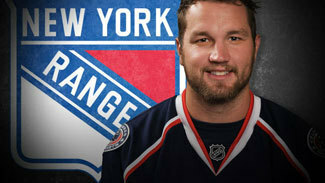 Erixon, who is the son of former Rangers player Jan Erixon, made the team out of training camp, but spent the majority of the season in the American Hockey League. Erixon played in 18 NHL games and had two assists -- but he had 33 points, including 30 assists, in 52 AHL games with the Connecticut Whale. He joins a defense corps that already has Jack Johnson, James Wisniewski, ex-Ranger Fedor Tyutin, Adrian Aucoin and Nikita Nikitin. The Blue Jackets also believe they're strong on defense with up-and-comers John Moore, whom Columbus selected two spots ahead of Erixon in the 2009 Draft, this year's No. 2 pick Ryan Murray, David Savard and Dalton Prout. "I like our NHL defense and I like what is coming," Howson said. Howson is confident Dubinsky's 2011-12 season was simply a bump in the road and not a sign of what's to come. After signing a four-year, $16.8 million contract extension last summer, Dubinsky put up 10 goals and 34 points in 77 games last season. That's a dip from the prior season, when he put up career-bests in goals (20), assists (34) and points (54). Howson also said he thinks Anisimov has great upside as a 24-year-old center. Anisimov fell eight points to 36 last season from his career-best 44 in 2010-11, but he is signed for only one more season at $1.875 million, so he still has a lot to prove. The Blue Jackets also are getting a first-round pick in the package, giving them three first-round picks in the 2013 NHL Draft. They have their own, as well as the pick that was acquired from Los Angeles along with Johnson in the deal that sent Jeff Carter to the Kings. "Rick's been a great player, but we're real excited about where we're going," Howson said.